Inspired by MIT’s center for bits and atoms, NBEL Innovation Workshops provides academics, industry professionals, entrepreneurs and passionate makers access to modern means for innovation. Uniquely, NBEL provides its expert services within the framework of a state-of-the-art integrated workshop, in which you can build your device and test it using our many prototyping modules, such as EEG, vision processing, hydraulics, control and automation. 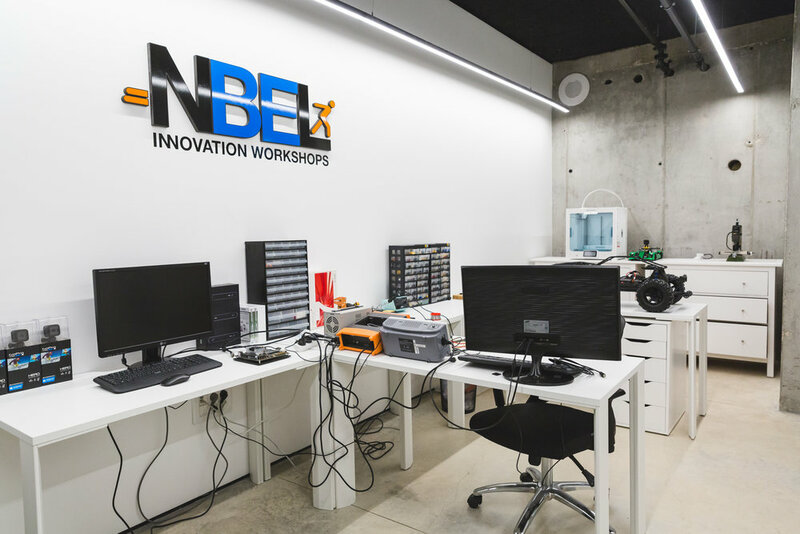 NBEL Innovation Workshops is a place to prototype, innovate, create, learn and play. NBEL Innovation workshops provides you with access to state of the art mechanical prototyping machinery, including 3D printing, CNC milling and laser scanning. Our tools provide geometric precision and accuracy, and were assembled to turn your ideas into functional, working prototypes. Our dual extrusion 3D printers have a large build volume, which delivers accurate, industrial-grade parts. We can print with Nylon, PLA, PVA, ABS, PC and PP materials, for a wide range of applications. With our CNC machines you will be able convert your 3D CAD designs into finely detailed products in both wood and metal. Our CNC can also be used to create custom designed printed circuit boards (PCBs) to support your electronics. Come and discover the power of EEG to enable mental commands for new brain-computer interfaces, or to revel mental states for your next application. With our proprietary software you can create and synchronise neuro-cognitive tests using wireless EEG measuring devices, and later automatically analyse the results. NBEL provides the community with access to a wide range of sensors, including temperature, humidity, pressure, GPS, motion and acceleration. We also have a range of communication modules ranging from infrared to bluetooth and wifi. Focusing on the biomedical field, we also have Pulse and oxygen in blood sensor (SPO2), Electrocardiogram sensor (ECG), and Electromyography Sensor (EMG). Specially designed for the biomedical field, the cutting edge mechanisms for fluidic control, as well as the means for creating custom designed fluidic devices, will be available for your usage, facilitated by NBEL. Our proprietary software allows for rapid prototyping (fabrication, control and automation) of fluidic devices from the micro scale and up. Embedded vision processing spans a wide spectrum of applications, ranging from computer-vision-based decision support in surgical robotics to mobile robot navigation. In NBEL you will have access to industry-leading solutions for vision processing such as NVIDIA’s Jetson super computers and custom processing implementation over advanced FPGA boards. At NBEL you will gain access to our proprietary software solutions, allowing you rapid prototyping with these advanced circuits. We offer access to state of the art control circuits. Come prototype with control and automation mechanisms, using devices ranging from Arduino and Raspberry Pi to industry leading solutions such as FPGA and custom hardware. NBEL provides expertise in data analysis and machine learning. We invite you to come and prototype with our supercomputers, which are powered by specially designed multi-core CPUs and powerful GPUs. In NBEL, we are particularly interested in embedded data analysis, or edge analytics, in which data is analyzed at the point of service with no need for a centralized data center. Come and explore the pros and cons of immediate, local insight to your solution.